It shouldn't take much for most of the readers to get my reference in the title. I'll be honest, it took me a few reads over different posts to fully grasp the phrase "white whale". As with Captain Nemo, it's the one exclusive item that you must conquer. At first, I thought a white whale referred to something very expensive. Now, those seeking white whales find they can get expensive, but that is just a factor in their rarity. A Michael Jordan autograph is definitely a pricey item, I don't think one would consider it a white whale. There are plenty available, if your wallet can afford them. Next, I thought a white whale was something old. Again, in one sense it can be, however, there are plenty of modern white whales in existence. Those of us trying to complete a card rainbow know the search for a printing plate or a platinum border. White whales for sure, but not by age. I have seen the Gould and the Swift Meats on Ebay, but nowhere near a price I can afford. 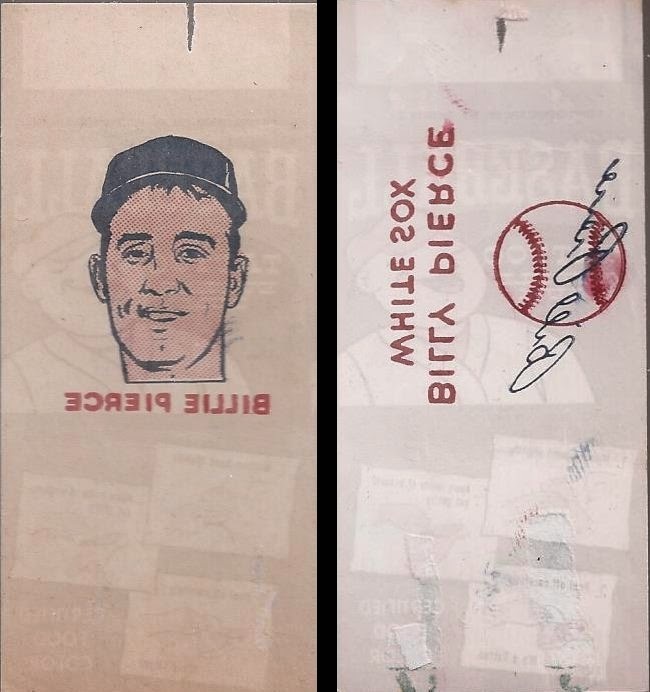 The '61 stamp I saw as an empty slot in a binder of stamps at a card show, so I assume it used to be there. The Bazooka and the Venezuelan back cards may be myths, as I have yet to see either in the real world, and only via internet images. But recently, what I would consider less of a white whale (maybe like a cod, sturgeon or halibut) showed up on Ebay. And not just one, but both from a specific set. I had seen the one before, but never both. I had to make sure to win them, so in the end I am not sure whether I overpaid. But it doesn't matter - I am still very happy to add them to my collection, both for the cost of a blaster. I am quite satisfied with the condition of both. I knew of the one with Billy's face, but had no clue of the existence of the autograph tattoo. I did consult a checklist and it's valid. Of course, that checklist does identify tattoo #73. Hey GCRL.....sorry. So while not quite the nemesis for Nemo, or myself, I reeled in these great white....tunas. Spelled Billie and Billy in the same set? And then his autograph looks like just Bill. Geez, pick a name and stick with it, Walter William. I'll be damned, you are the guy that beat me out on both of those. Great pickups! Congrats and "Land Ho!!" I'll live to harpoon another day.